Contemporary Indian fare in the Fairfax District. 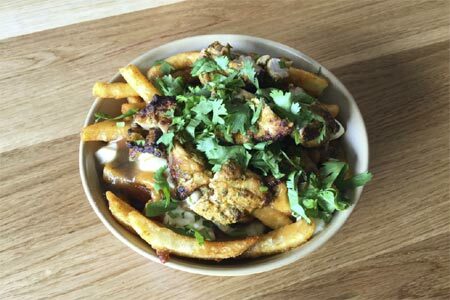 : This Fairfax Avenue outpost of the DTLA contemporary Indian restaurant offers old favorites and some new dishes including flaky catfish Punjabi fish fry, chicken tikka poutine, spiced lamb burger on brioche, creamy black lentils and ghost chili lamb vindaloo. Also located at 108 W. 2nd St., #104, 213-221-7466.